A friend of mine took this photo of me (on the right) and another friend inside the Café Ar Ramadi. After this office was blown up by a rocket I asked my boss if I could start a coffee shop in it. Using donated equipment and supplies, we were able to provide an area for people to take a break and have a good cup of coffee. The outpouring of support from back home was incredible. Family members of our Soldiers, as well as strangers, sent us stuff for the shop. In the foreground you see several bags of coffee--donated directly by Peet's Coffee after they heard about us from a family member. This coffee was the best! 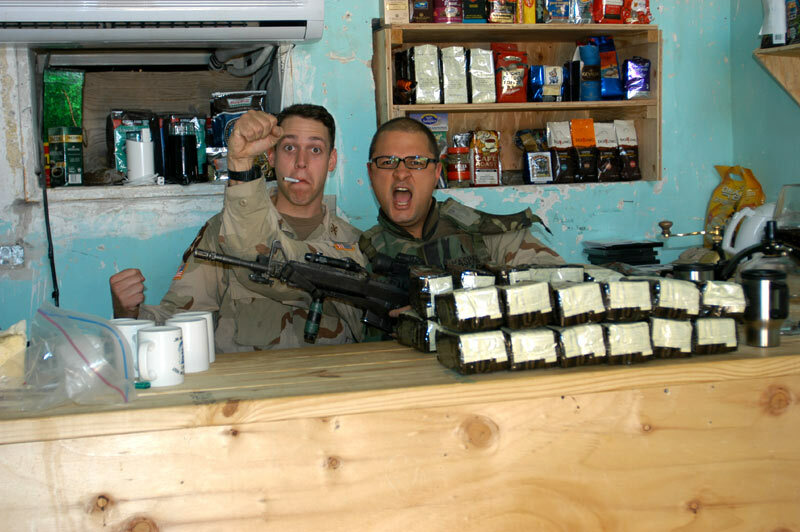 The shop felt like a different universe from that outside--even though it took some more shrapnel from mortars and rockets during "coffee operations."